Here are the answers for the zero-force member question from here. Zero-Force members are highlighted in green. AB - summing the vertical forces at joint B reveals AB to be zero. 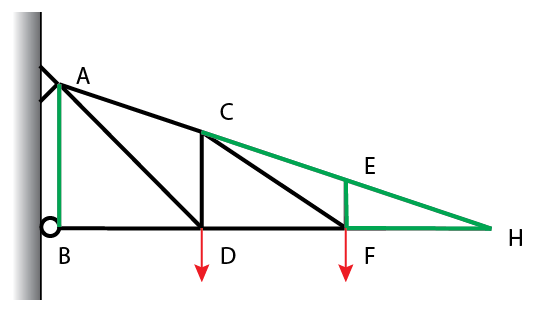 EF - CE and EH are parallel and there are no external forces at joint E (Rule 1). EH - Joint H has only two members and no external force, both members are zero force (Rule 2). CE - Re-analyzing joint C, after knowing that EH is zero, reveals this member is zero. Please comment if anything is amiss or you need more clarification, I will gladly respond!